Sunday February 10th - Breakfast Run. Sunday March 3rd - Breakfast Run. 22nd March 8pm - curry night at Indian Nights followed by drinks in the Brew House Micro Pub, both on Boundary Road in Streetly. Sunday April 14th - Breakfast Run. Sunday May 5th - Breakfast Run. Suitable for all abilities including walkers. Meet at the front of The Avion (Wetherspoons) pub at 9.30am. Out and back run or walk - half an hour out and then turn around and come back to the Avion. (Route will be along Leighswood Road and then onto the canal). Everyone arrives back at the Avion at 10.30 for breakfast. Feel free to join us at 10.30 even if you aren't able to do the run. Sunday June 16th - Breakfast Run. Suitable for all abilities including walkers. Meet at the front of The Avion (Wetherspoons) pub at 9.30am. Out and back run or walk - half an hour out and then turn around and come back to the Avion. (Route will be along Leighswood Road and then onto the canal). Everyone arrives back at the Avion at 10.30 for breakfast. Feel free to join us at 10.30 even if you aren't able to do the run. Friday November 8th - ARC Annual Presentation Evening, Aston Wood Golf Club. December- a group will be going to Lanzarote again for the marathon, half-marathon and 10k on Saturday 7th. Something for everyone - see Jo Yarnall for details. 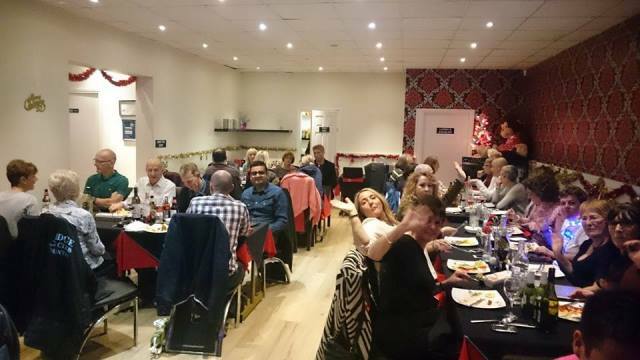 Curry nights are always popular!